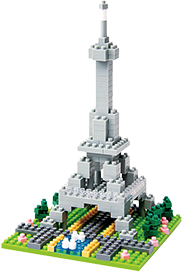 With elements of construction of 5 mm high, nanoblock ® is, the most incredible construction game in the world. It allows to build mini figurines of an unequalled precision. Launched in 2008 in Japan, the nanoblock’s collection does not stop getting bigger as the seasons go by. These miniatures close to the graphic art of the pixel seduce young and adult. The models come around the themes: animals, famous monuments, musical instruments and many more … So many possibilities to indulge itself or to offer. Every model of nanoblock contains different degrees of difficulty. From the beginner to the expert, there is always a model which satisfies the envies for the fans all around the world. In every package, the model is delivered with an assembly step by step instructions. It also contains some extra bricks.